They are cumulative, so the enterprise edition comprises all the features and functions of the platform, which contains spatial, and so on. 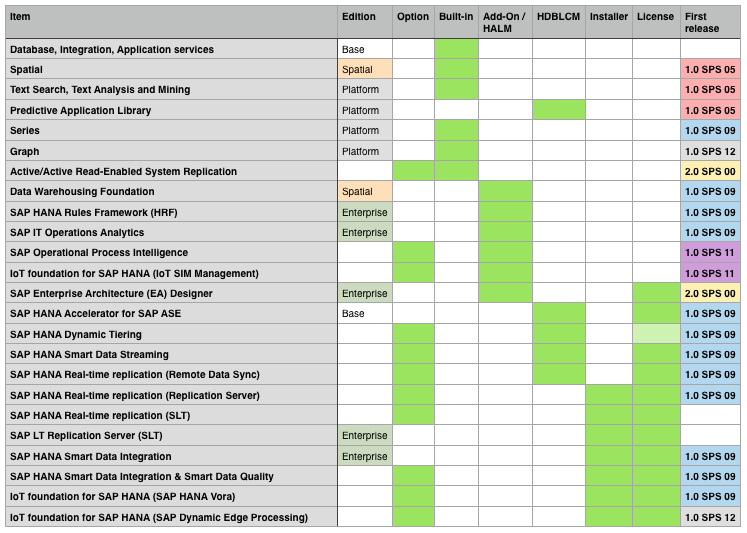 Below all the SAP HANA 2.0 editions and options in a single table. A green box in the Built-in column means that the functionality is included with the HANA server. You cannot take it out, at the most you need to enable it using a system parameter but often this not required. A green box in the Add-On / HALM (HANA Application Lifecycle Management) column means it is provided as a delivery unit (DU) and requires SAP HANA XS(A) to run, whereas a green box in the HDBLCM (HANA Platform Lifecycle Management) column indicates that the product is installed as a HANA component. In both cases, you will need to download the component and install (and configure) it. Apart from PAL, all are listed as a separate product in the Product Availability Matrix. A green box in the Installer column means that the product has its own installer and also with their own entry in the Product Availability Matrix, also used in scenarios not related to SAP HANA. A green box in the License column means that the product requires its own license. This is typically the case with independent technologies (SLT running ABAP) or acquisition technologies (Business Objects, Sybase).